Correctly defined, Islamophobia is a structural organizing principle that is employed to rationalize and extend the dominant global power alignment, while attempting to silence the collective global other. Yes, the basic term, “Islamophobia,” can be defined as “fear,” “anxiety” or “phobia” of Muslims, but at the same time it is a far more encompassing process impacting law, economy, and society. At one level, its civil society ideologues attempt to classify who belongs to the “civilized world,” the criteria for membership, and who is the demonized and ostracized global other. At a deeper level, Islamophobia is a renewed drive to rationalize existing domestic and global racial stratification, economic power hierarchies, and open-ended militarism. Islamophobia reintroduces and reaffirms racial structures that are used to regulate resource distribution domestically and globally. At the core, demonization of the Muslim subject has less to do with the subject him/herself and more to do with the cunning forces that view the targeting of Muslims and Islam as the best strategy to rehabilitate their discredited agenda and image in society. Peddling and stoking fear is utilized as a substitute for offering sound economic and social policies and engaging in legitimate debates on how best to address the multitude of challenges facing society in general. Islamophobia makes it possible to reduce and narrow the scope of the debates and frame national issues under the rubric of national security and through a manipulative appeal to patriotism. …We must be reminded that the debates are not about the nature of Islam as a religion, but rather about the rights of Muslims as citizens and equals in American and Western society. Reducing the rights and citizenship of Muslims to a debate about the nature of Islam allows the right wing and Islamophobes to externalize and demonize Muslims, especially by magnifying cultural differences, a strategy which then gets packaged into campaigns to save Western society from a possible takeover. … “Take our country back” is shorthand for opposing equality, fairness, and dignity for all Americans, and Islamophobia is used to obfuscate the real targets. Facts, data, and real narratives are irrelevant in the Islamophobic imagination because the constructed frame filters everything and reduces it to stereotypes revolving around violence and terror. In this context, Islamophobia is less about Islam or Muslims and more about the uncertainty of society as a whole. The ongoing otherization project [to treat Muslims as the ‘other’, meaning strange, even primitive] defines politics, culture, economy, religion and identity by magnifying the differences between America and Islam, and then transforming them into an existential threat in the minds of Americans, which in turn promotes a false sense of patriotic unity during a time when rapid and global political, economic, and social changes generate national uncertainty. Noticeably, all these grievances [i.e. policies and regulations that ”weaken America/ Europe”] point away from the country’s elite[s], which has plundered the United States [/Europe: reducing the ’common good’], ravaged the earth of its resources, conducted endless interventionist wars, and squandered the money of hardworking people across this great land. Lastly, on a more positive note, …the otherization of Muslims and Islam by Trump and his administration has awakened a sleeping civil society giant, a human decency guided by universal ethical and moral imperatives that can produce a counternarrative. It is this part of the society that will have the last word on the difference between facts and bigotry. How can we best counter this anti-Muslim strategy and provide an exit from this path that can surely lead to disaster…? 1.) Defeating Islamophobia is a collective civil society responsibility. Islamophobia is a civil society problem and not only a Muslim issue. This means everyone has a role to play in countering and pushing against the rising tide of Islamophobia. Attacks on Muslims and immigrants are carried out in the name of defending society from a contrived threat while the real targets are the majority in the society that is being stoked toward hatred and bigotry. Once we accept that the majority is the real target, then the responsibility to counter Islamophobia and bigotry falls on everyone who desires a fair, just, and inclusive society rooted in the defense of constitutional rights and promotion of racial, religious, and cultural diversity. 2.) We must expose and marginalize Islamophobic voices. The current political elites on the local, state, and national level must speak forcefully and continuously against Islamophobia and be proactive in exploring opportunities to expose the voices of bigotry and fear. Many in the Islamophobia industry who act as spokespersons, serve on organizational boards, and are active in various civil society arenas feel at ease because their bigotry meets no resistance. Anyone who engages or supports any aspect of the Islamophobia industry must be exposed and marginalized in civil society. 3.) Society and the law must embrace Muslims as equals. Since the right wing and the Islamophobia industry attempt to isolate and marginalize Muslims, immigrants, and racial minorities, the response from the responsible and visionary political leadership should be the opposite. Defending and embracing the Muslim subject does not mean avoiding criticism of Muslims or Islam, but recognizing that the political debate about Muslims has nothing to do with the religion, theology, or history of 1.6 billion people. The political leadership must embrace Muslims as equals and partners in developing the agenda for the betterment of the society and go beyond engaging Muslims through a narrow securitization lens. 4.) Know that Muslim women are primary targets. The role of Muslim women is a central mobilizing and rationalizing tool for the structural process of othering Islam and Muslims. While violence and structural discrimination against women is a global reality, we must recognize the mobilization of a constructed Orientalist paradigm in service of Islamophobic discourses directed at maintaining global male power hierarchies and marginalizing Muslim women and men alike. At a time when violence, sexism and discrimination against women are receiving much-needed and overdue attention, the experiences of Muslim women are often left out. Muslim women are undertaking and leading the resistance against the Islamophobia industry and must be supported in this endeavor and not doubly marginalized by civil society. 5.) Build a new civil and human rights coalition. All groups and individuals that are serious in wanting to reclaim civil society from the fearmongers must work hard to develop a broad-based civil and human rights coalition to carry the political agenda forward. This coalition is only possible if all the impacted communities and their allies come together. No single group can bring about this change, and Muslims alone can’t defeat Islamophobia, counter the anti-immigrant venom, and stop anti-black racism in today’s America/ Europe, but a collective and broad-based coalition can and will make a difference. 6.) Ignore and report Islamophobes online and amplify credible voices. The internet and social media are the primary fields where the crudest forms of Islamophobia get deployed before making their way to the mainstream outlets. While the Islamophobia industry is made of some 101 groups and organizations that employ a relatively small number of people, their footprint and reach far exceed their numbers due to their mastery of social media and the internet. Responding to online Islamophobic posts is a poor strategy that only amplifies Islamophobic messages to a new audience. Countering Islamophobia on the internet requires withholding direct response to negative messaging, documenting and reporting these occurrences to social media companies, and amplifying credible voices from civil society while providing sound research. 7.) Develop a civil society rapid response team. 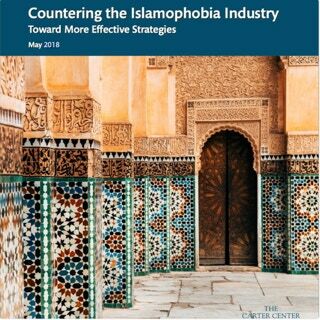 The Islamophobia industry is well funded and has a national and international infrastructure that works to magnify and intensify the negative Islamophobic campaigns with support from key media outlets. Responding individually or organizationally is a futile endeavor for anyone or any group since the opposition operates in a well-coordinated and highly integrated campaign. The national civil rights and human rights coalition needs to develop a “rapid response team” that includes key participants from all groups with a focus on development of immediate countermeasures to undo the effects of Islamophobic campaigns or minimize their impact on the mainstream. 8.) Incubate funds and endowments to counter Islamophobia. At a time when the right wing and the Islamophobia industry have access to millions if not billions of dollars to push bigotry and fear in civil society, the response calls for mustering resources and deploying them effectively. Civil society leaders and organizations should work to incubate resources or develop endowments that can fund projects and community-based initiatives working to counter the rising tide of Islamophobia, fear and bigotry. Certainly, the right wing and the Islamophobia industry seem to have access to significant resources, which we might not be able to match, but effectively deployed resources can go a long way in defeating the forces of bigotry, racism, and darkness. 9.) De-link defeating Islamophobia and countering violent extremism. The Islamophobia industry has constantly made the link between demonization of Muslims and acts of terrorism. The link has been so ingrained in the mind of so many in civil society that the discussion about Islamophobia is often coupled with countering violent extremism initiatives. The net effect of this link makes ending or countering Islamophobia contingent on defeating or countering violent extremism, which is a faulty association. 10.) Share and highlight sound research. 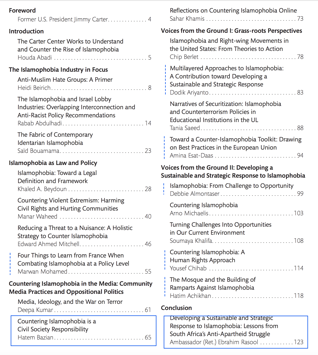 Academic and community-based projects have been in the forefront in documenting, researching and sharing evidence on the impact of Islamophobia, but with limited national exposure and recognition. Countering Islamophobia calls for highlighting the work of the unsung and underfunded heroes who work tirelessly while constantly under attack from the Islamophobia industry. Synthesizing the work by sharing website links and research coming out of these institutions will go a long way in impacting civil society and reshaping the American Muslim experience with Islamophobia and how best to systematically address it.